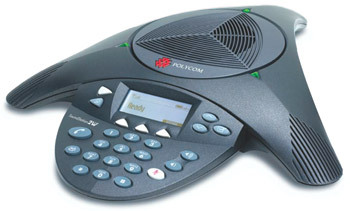 The SoundStation 2 Direct Connect for Nortel Meridian allows you to take advantage of Polycom’s legendary voice quality in your conference rooms without the need for an analog port, analog adapter, or complicated connections. SoundStation2 Direct Connect for Nortel is the ideal conference phone for Nortel Meridian digital PBX environments. Simply connect the conference phone directly into a Meridian digital wall jack and start making calls. Remarkable Voice Quality - Users can speak in a normal voice up to ten feet away from the console. More productive calls – no need to repeat yourself! Three cardioid microphones povide 360-degree coverage so that everybody in the room can be heard clearly. Dynamic Noise Reduction (DNR) - Automatically reduces room background noise – from fans, projectors, heating and air conditioning – for clearer sound and more efficient conferencing. Intelligent Microphone Mixing - Automatically selects the microphone closest to the person speaking, eliminating extraneous background noises. Microphone Expandability - Optional extension microphones increase coverage for larger size rooms. Backlit Graphical Display - Convenient, easy access to important call information – phone number, number called, duration/progress of call and Caller ID. Familiar, easy to use telephony features – phone book, conferencing, mute, and hold – eliminate user confusion and need for training. Auxiliary Input/Output Jacks - 2.5mm jack: Provides connection to other communication devices, such as a mobile phone, for hands-free conferencing. An RCA jack allows connections to other peripherals, such as an audio recorder. Single-cord Connection to Phone Console - Eliminates cable clutter on the tabletop.